Mesmerizing and seductive, orchids have become one of the most popular houseplants of all time. Last September, B&G Orchids opened its doors in Miami, offering insight into the mystery of these spectacular flowers in a large variety of shapes, colors, and sizes. 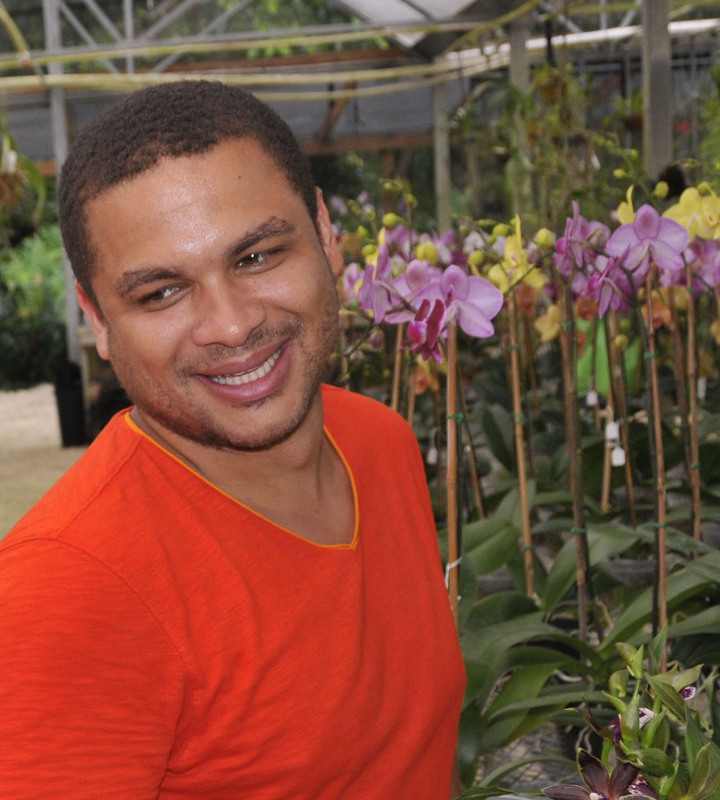 Although the gorgeous nursery is mostly run by Bernard Lavaud and his mother Gladys who share a passion for the fascinating world of orchids, B&G Orchids involves all the members of a close-knit family. Behind the scene, there’s Ralph, the oldest of the three Lavaud brothers, serving as the webmaster of bgorchids.com. And then, there’s Claude, the charismatic Public Relations officer. As for Jean, Gladys’ husband, he does what fathers do best: watch over the family, offering his guidance and enthusiasm. MJ: Bernard, orchids are simply breathtaking. Tell us a little bit about the debuts of B&G Orchids. BERNARD: In my family, the love for plants seems to run in our blood—from my grandmother who’s always collected ferns and aroids, to my aunt Nicole who is trying desperately to grow a garden in the mountains of Santa Fe, and of course to my mom who won’t let anything green go to waste. As a child I always did the “plant thing” with Mom; it’s what brought us so close. At one point in my life I had a 2,500-plant collection. My love for all plants later became centered on orchids, which led to B&G Orchids’ fantastic grand opening last September. While it rained all day in the Miami area, our little paradise remained sunny and lush, and the real plant lovers came to enjoy our sweeping displays. It is our intention to grow plants that are healthy and beautiful and easy to care for, and also to educate our clientele about South Florida orchids—mainly how these plants can be kept as gorgeous as the first day they’re picked from the green house. If given proper care, we can grow our plants for many years. Some of the orchids discovered early in the last century are still found in collections today. BERNARD: Back home, in Haiti, orchids were the talk of the town in garden clubs. During a trip to La Visite National Park in 1996, I was amazed by the countless orchids—from tolumnias to epidendrums—growing in their natural habitats. When I first moved to Florida to attend school, I didn’t have much space to tend a garden; in order to ease my uprooting from home, I got an orchid from Kmart. Orchids soon turned into a passion that I now live everyday. An orchid might start as a plant, but then evolves into a pet. We water, feed, prune, repot, and provide medications when needed. And as a result, we get blooms, a joyous moment that might come after several years. Maybe that’s the root of people’s addiction to orchids— the blooms are the reward we get from these plants that are endangered for the most part, and fragile in many cases. MJ: There are more than 25,000 documented orchid species throughout the world, and more are being discovered every day. Mystery, beauty, unknowability… Orchids are often linked to passion itself, and real orchid lovers are told to be possessed by the orchids and go to amazing lengths in order to gratify their passion. The people who love orchids love them madly. Orchid fever. Is this passion evident in the people who visit B&G Orchids? Is this passion evident within your own family? BERNARD: The passion often grows to unbelievable stages. The “I must have it” feeling is often what drives collectors to spend unbelievable sums on orchid plants. These collectors are always the first ones to arrive at the orchid shows, as they need to get all the “good stuff” first. Very often, prices don’t matter. I, for one, have done it many times. Some plants are so rare and impressive that they get recognized by the American Orchid Society (AOS). The prospect of getting an AOS award drives collectors to grow and buy the best and further their chance at world recognition. Awards become an incentive for growers to keep their hobby alive; they bring out a bit of the competitive aspect also. I have gotten many of my specimens rewarded; it is something all orchids lovers should seek to achieve. MJ: What do you think it is about orchids that seduce humans so completely that they are compelled to worship them and are willing sometimes to wait for nearly a decade for a plant to flower? BERNARD: It used to be that every orchid was something of a rarity, each one a unique treasure. After they were found in the wild, plants would take years to recover and acclimate themselves to their new habitats. Getting them to bloom was an accomplishment—hence the veneration of the plant. Nowadays we no longer have to wait ages for our plants to bloom. If you’re not a serious collector, home depot carries many flowering plants. With proper cultivation, we have plants that bloom many times a year, from Vandas and Ascocendas which we, at B&G Orchids, grow a lot of, to the Cattleya (the “Queen of orchids”) which produces a spectacular show every year at its season. If done right, a collection can have different flowers blooming throughout the year, and I believe that’s enough of a reason to grow as many as we can. MJ: In her essay, “Orchid Fever,” writer Susan Orlean points out that because orchids can be mutated, crossbred, and cloned, “they can take the form of complex architectural structures or of garish, glamorous, luscious flowers.” Whatever the case, orchids like to be admired. What is, in your opinion, the most beautiful orchid offered at the nursery? BERNARD: I usually tell anyone who asks that I don’t have a favorite orchid. If I do, my preference depends on a particular season. Specimen plants in general are a thing to be admired: a grower took years to carefully bring a plant to maturity, and this plant is now profuse in its production of flowers. I have a few large plants of my own that I admire; that include my dendrobium little sweet scent that blooms in April every year, and my lady sleepers, which are such characters of their own. If I were to choose a favorite, I would go for the hybrids that I have made myself—the product of years of labor that involved making the seedpod and growing the plants for almost four years before I could see them bloom. My mom doesn’t have favorites. If it’s an orchid, she loves it blindly and wants it… or a few of it. Since Florida’s weather allows us to grow almost everything tropical, we, at B&G Orchids, try to provide something for everyone. Primarily our family grows Vandaceaous orchids: vandas, ascocendas, renantheras, and the such. 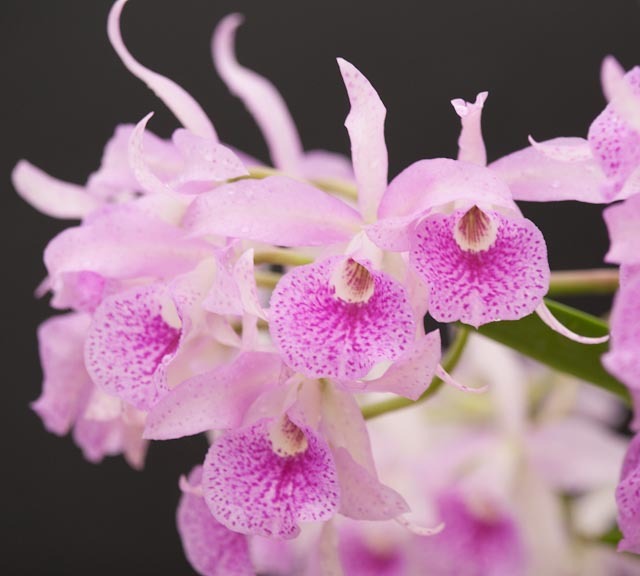 We also carry Cattleya species, dendrobiums, warm growing cymbidiums, and also the grammatophylum, which is the largest growing orchid in the word. In their habitat they can reach a ton in weight. MJ: When caring for plants as delicate as orchids, one must employ a measure of discipline and patience. As a first timer, what are some other basic things I need to know before I buy an orchid? How tricky are these plants? BERNARD: The trick to an orchid is consistency, and of course keeping up with the way it grows in nature. Water on a regular basis (or daily, for some). Some species require bright light; others thrive in the shade. Of course a bit of good plant food on a regular basis is an excellent idea; don’t give plant food at all if consistency is not something you can embrace, as repetition is the key with orchids. MJ: Next week, the Tamiami International Orchid Festival will celebrate orchids’ spectacular beauty and diversity. Thousands of orchids, from miniatures named “Pinhead” to giant violet vandas, will fill a luxuriant tropical landscape. Tell us what to expect from your participation at the festival? BERNARD: For hobbyists, orchid shows and festivals offer the opportunity to visit different vendors. And of course: to shop. The Tamiami festival is a very popular show in Miami and across the states. It’s important for B&G Orchids to be present and in a way support the orchid community in South Florida. We hope to let orchid lovers know that we’ll be showcasing our orchids, both for sale and for the exhibition. Check out B&G Orchids on Facebook. What a great article. I used to work for a florist in NY. The only orchid names I remember are the dendrobiums, cymidiums and phalaenopsis. The test now would be to see if I could pick them out at B&G. 🙂 Great job.